Oftentimes, business professionals tend to use the terms “shared office spaces” and “co-working spaces” interchangeably without realizing that there’s actually a distinct difference between the two concepts. Shared office space is when an office building is shared by multiple companies who each have their own private work spaces. While each company has their own separate office space, they all often share the office amenities such as a reception, kitchen, or mailroom. A co-working space, on the other hand, is when separate companies and/or individuals share the same workspace. Usually, co-working spaces are open-concept offices with various employees from different companies working alongside each other. If you’re looking to rent an office space in a major city like Mississauga and Ottawa, it’s important to know exactly what type of office space you need. Keep on reading to learn about the major differences between co-working spaces and shared office spaces. Start by examining your company finances, the size of your business, and the specific needs of your employees in combination with your clients. If you find that your company holds a lot of meetings or conferences on a weekly basis, then it may be more advisable to go for a shared office space that offers you the level of privacy you need without completely segregating your employees from one another. Co-workers will still be able to communicate freely amongst one another and work efficiently within close proximity to one another or collaborate on mutual projects, but they’ll also have their own personal workspace that’s separate from their surroundings. Co-working spaces are generally great for startup companies who like the idea of easy, open, convenient, and efficient communication amongst co-workers while also promoting stronger productivity. While some co-working spaces also offer the option to use private offices, for the most part, they promote the wide-open concept spaces that a lot of young entrepreneurs prefer for their businesses. Now that you have a clear idea of what the main differences are between shared and co-working office spaces, it’s time to measure the advantages and disadvantages of both by comparing their individual attributes. Freelancers, startups, entrepreneurs, and people who typically work remotely benefit the most from renting a co-working space. These are creative business professionals who thrive from working in animated surroundings and they only need the workspace on a temporary basis either to meet with clients or collaborate on projects with their peers and colleagues. Oftentimes, they might be working on a project with someone from a different company or they’re not affiliated with any specific business at all and want to form a merger. Co-working spaces are a great starting point because they offer excellent Wi-Fi, access to necessary office equipment, and ample desk space to help you effectively manage your business without impeding on the space of other people around you. Shared office spaces, on the other hand, also offer a large array of amenities such as kitchens, bathrooms, Wi-Fi, and access to boardrooms whenever you need them. The success of any business relies largely on its internal community structure and adaptability. Your company needs to be able to evolve over time and renting shared office space can help you accomplish that goal. Whether you start off as a sole proprietor or small partnership, there’s no doubt that your goal is to expand your business over time and make it as successful as possible. In fact, you may even be hoping to someday expand to multiple national and international locations as per your growing customer base. The type of workspace you provide for your employees has a big influence on the type of work they’re able to produce and how productive they are throughout the workday. Keep in mind that everyone has different preferences and you won’t necessarily be able to please all of them, but it’s also important to reach some kind of close consensus amongst the people that work for you because that’s how you build a strong company culture. All office spaces, regardless of the layout or size, should have the basic amenities available to the people who work there. 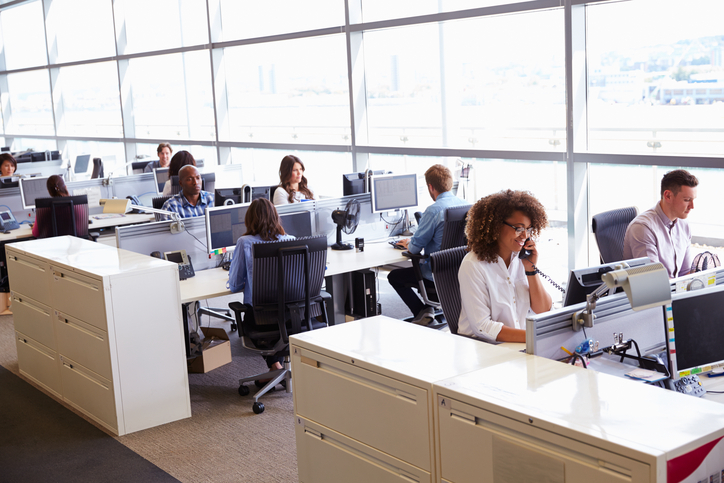 Office equipment such as printers, fax machines, and telephones are all staples that are usually provided by shared and co-working business centres. Most office spaces even offer break rooms, kitchenettes and bathrooms that are delineated specifically for the companies that inhabit them. With both shared office spaces and co-working spaces, you’ll be sharing these facilities with both your employees and the employees of other companies on the same floor as you. Cost is usually the clincher for a lot of small- and medium-sized businesses because in some cases, it can either make or break their budget. Regardless of whether you opt for a shared or co-working office space, you want to make sure that the rental rates won’t completely offset your company’s budget. Typically, office space rental services charge based on the amount of square footage your company occupies. The number of employees you have to account for, how much desk space they each require as well as the amenities they use are all taken into consideration when determining the cost of your rental package. Innovative Professional Offices offers state-of-the-art fully furnished and stylish office spaces for rent in Ottawa and Mississauga that are completely flexible to meet the needs of your unique business. Services included in our comprehensive rental packages include full use of our office equipment, access to facilities, IT support, free Wi-Fi, mail acceptance, as well as use of a full reception staff to greet clients and answer phone calls on your behalf. To learn more about our exceptional office rental packages, please feel free to contact us today.